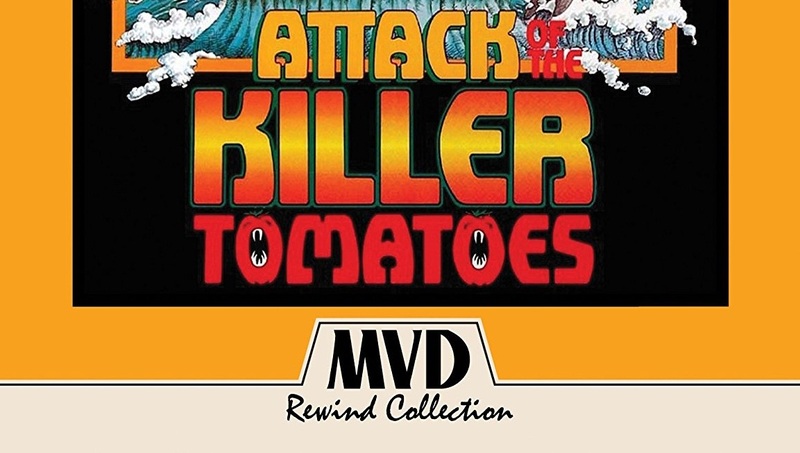 Adam takes a look at the new shiny Blu-Ray edition of Attack of the Killer Tomatoes from MVD and their new Rewind Collection. Before Airplane! there was The Tomatoes. Now, first doesn’t necessarily mean better. Often times it just means first. In the case of the joke-a-minute parodies that is still the case. But this isn’t a binary argument, just because one is better than the other does not mean there isn’t room for both. Point, in fact, there is. This late in the game (close to forty years now) you know where you stand with Attack of the Killer Tomatoes. You know the song, hell you may know the song better than the actual film. The film is actually much like Airplane! a ridiculous comedy about the conventions of a specific genre. Where the Zucker-Abrahams-Zucker classic dismantled the disaster movie, Attack of the Killer Tomatoes takes on the monster movies of the 1950s and Japan. There is little to no art involved in this late 70’s cult classic. It’s a sledgehammer being swung wide and far. Nothing is left to chance in this film. There is something to offend everyone in this film now but not in an artful way. The sledgehammer applies even more so to the jokes. Even with the artlessness of the proceedings there is still a gonzo sense of play and daring that’s infectious and fun all the way through. It may not make you laugh but it is designed to entertain and offend. Two things that make strange bedfellows for sure. Attack of the Killer Tomatoes ultimately even with its offensive jokes, inarticulate direction and stiff acting is harmless crass fun. Regardless of what one thinks of the film the newly remastered 4K digital transfer of the film is revelatory. Those AOTKT fans are going to flip for this transfer. The picture is gorgeous. MVD has taken the time to restore the film to a condition that looks better than it did upon initial theatrical release. MVD has come out swinging with this release. The disc is stacked with special features. Crash and Burn is by far the best featurette as it discusses in detail the helicopter crash that happened while filming and how they used it in the film. Thankfully, no one was hurt during the accident, though even now the crash is jaw-dropping. Legacy of a Legend is a 14-minute making-of featurette that does a great job of discussing the making of, release and after effects of Attack of the Killer Tomatoes. Great stock footage from Johnny Carson, a connection to Mars Attack! and a bunch of amusing zany stories makes this a fun, much better than the average making of. Famous Foul, Killer Tomatomania, Where Are They Now?, We Told You So!, and Slated for Success are all featurettes make with serious tongue-in-cheek making fun of the various types of EPK or special features that many have come to love and to dread since the advent of DVD (Laserdisc actually, but who’s really keeping track other than us?). So much so Killer Tomatomania has the producers literally walking around Hollywood & Highland (in Hollywood) asking random strangers their thoughts on Attack of the Killer Tomatoes most of which have no clue what the producers are talking about. The two short films included Gone with the Babusuland and Attack of the Killer Tomatoes both include commentaries and are fun albeit overly long shorts but definitely show you the throughline to the bigger budgeted version of Attack of the Killer Tomatoes. The three deleted scenes do not amount to much but it’s definitely fun to have them. The audio commentary is fairly fun with all participants in a lively and very jokey mood. Any fan of the film will love this commentary. Production design photo gallery, Radio Spots, Original Theatrical Trailer round out the exhaustive collection of extras. The most entertaining of these are the radio spots which should be listened rather than described. MVD’s Rewind Collection with Attack of the Killer Tomatoes shows this Boutique label means business. Not just content with giving us a much-requested Cult Classic but giving it a definitive edition with a truly great transfer and great extras. Recommended!! !